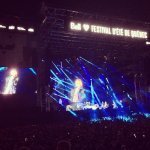 Def Leppard played a show at the Festival d'ete de Quebec in Quebec City, Canada last night and setlist details are available. The band played a slightly longer 17 song set with Foreigner and Danko Jones in support. The show took place on a huge outdoor stage with the band using the festivals own video screens. 9 songs were played from the 'Hysteria' album with 'Gods Of War' back in for the first time since the Uppsala show. 'Don't Shoot Shotgun' was also back in for the first time since the last full Hysteria album show in Madrid on 26th June. The next show takes place tomorrow night in Gilford, NH. Played for the first time in this city. Played in this city for the first time since the 20th August 1992 show. Played in this city for the first time since the 9th June 1988 show.